Ron Smith – Founder and now editor of The Washbag, laughing at those who said his ambition to be a sports writer was a dyslexic’s pipe dream. A Swindon supporter grounded in the teachings of Ossie, Glenn and err… King, Ron’s first football memory was standing on the vegetable patch in front of the Arkells Stand celebrating our Play-Off Semi Final victory over Blackburn in May 1990. A few weeks later on the protest demonstration around the streets of Swindon was never going to be a good time to find out you are allergic to red face paint. 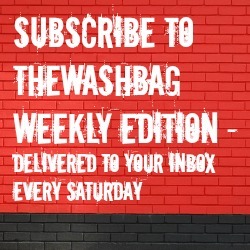 The Washbag has enabled Ron to make contributions to World Soccer’s Football 2012-2015, Seventytwounfortunate’s 2011/12 Football League Preview and a range of football blogs. Ron has been the Swindon Town and Swindon Supermarine Researcher for Sports Interactive, makers of the ‘Football Manager’ series; Ron is also a board member of TrustSTFC – the Swindon Town Supporters Trust. Alex Cooke – Alex is an embittered Swindon fan: during his early years he missed much of Lou Macari’s ascent due to being raised in a house of cricket fans. He missed much of McMahon’s promotion season due to student poverty and he missed part of Wilson’s play-off run due to the arrival of his first daughter. However, inbetween he has sat through season after season of mediocrity at home and on the road under the management of Quinn, Todd, King, Evans and Malpas. Which explains why sometimes, just sometimes, his view might be somewhat cynical. Alex for some inexplicable reason takes an interest in tactics and formations. He’s easy to spot at Town games, he’s the one not booing every short corner. Brendan Hobbs – has been a Swindon fan for over 30 years, having been to see his first game in 1979 he has remained pretty much ever present since. He reckons his obsession has cost him numerous relationships (also a lot of cash) and even when he finally settled down and got married all the tables at the reception were named after Town players, with his favourite player Steve White getting the nod as the top table. He has sat in the same seat in the Don Rogers since its construction – P155, which is the most hilarious seat in the whole stand according to him – as he never tires of childishly telling people that he happily sits in PISS every other week. His favourite game was the 3-2 win away at Wycombe in the 2002/03 season and the worst – away to Brighton in the 2003/4 playoffs – where the harsh defeat was served with a side helping of pneumonia from the rain. Brendan is TheWashbag’s graphics guy. Vic Morgan – Vic has been reporting on Swindon Town since the mid 1980s. The first game he covered was Lou Macari’s first match in charge, in 1984/85 and a 2-1 win over Wrexham. Having watched Swindon since the early 1960′s, it’s been a dream job for Vic. Record title wins, Wembley finals, relegations, and demotions for financial irregularities, have all been covered by the Devon based Town fanatic. Managers such as Macari, Ossie Ardilles, Glenn Hoddle, etc, have all been interviewed by Vic. Often asked who his favourite Swindon player is, Vic will talk of the likes of Don Rogers, John Trollope, Steve White, Jimmy Allen, Colin Calderwood and many more in glowing terms. But admits is favourite is former Town full back Will Dixon. Famous for his zappata like moustache. The ‘Don’s’ third goal against Arsenal is a cherished memory, as is Kenny Stroud’s rocket against Everton, and Rory Fallon’s overhead kick against Bristol City. So much joy, anger, and passion comes from following Swindon, and Vic loves every moment of it. Only Led Zeppelin come close, as a lifetime obsession. He works for BBC Radio Devon in Plymouth presenting the Late Night show in the south west, as well as covering Swindon for BBC Wiltshire. Matt Arnold – grew up in Swindon on the upper second tier styling of the Ardiles and Hoddle eras, and considers it an affront to all that is decent that Town don’t scale such giddy heights today. After a brief spell as a teenage fanzine editor (the Randy Robin), he went to University in Leeds and had the dubious pleasure of seeing turn of the century Town getting trounced at various northern outposts. Moving to the capital after graduating, he’s now a member of the London Reds; a Swindon supporters group that boasts around 40 members, a massive flag and a never ending email chain riddled with in jokes and arguments about which pub to meet in. It’s still probably more coherent than most of his Washbag posts. Chris Linnell – Having only moved to North Wiltshire in his teenage years, his love for Swindon Town came slightly later than most. While his primary focus had always been on the Premier League, he soon established an addiction for the goings on in the lower echelons of the English Football League. When not at the County Ground, he can be found writing and Tweeting about the beautiful game for various publications, including Here is the City, uMAXit.com and his own site The Boot Room (tbrfootball.com). Meanwhile, his work has also previously appeared on Squawka and Eurosport. A Modern History and Politics graduate from the University of Liverpool, he now also works full-time as a Technology Consultant for KPMG. Adam Tanner – Swindon born and bred, Adam was fortunate enough to witness Wembley ’93 and many of the associated glory days. Sadly, most of them passed in a panic-stricken frenzy; the fear of popping balloons has survived to this day. He became “hooked” just in time to witness the subsequent 20 years of crisis and trauma. Favourite moments include some remarkable semi-finals. Least favourite moments include some… ”remarkable” finals. Adam’s interest in journalism was fuelled by a desire to publicise facts in support of his dislike of Andy Williams (who never scored a goal resulting from a corner or free kick in 105 games for Swindon, in case you were wondering). His claim to fame is that he was born on the very same day as Raffa de Vita; Raffa’s hairline just hasn’t lasted so well. At 18, Adam’s desire to find a club more prone to disaster than Swindon took him to Coventry, where he has lived in exile for much of the last decade. Nick Judd – A Swindon Town fan for 20 years, Nick stumbled into football journalism by accident. Applying for the programme editor’s job after being convinced it was a good idea by his old man during a friendly against West Ham United in 2000, he ended up working for the club for three years during which time he regularly fell out – and back in – with Andy King and spent hours playing football tennis in the club gym. He joined Manchester United’s magazine in August 2003 and now edits publications for the FA, as well as writing for a variety of publications including FourFourtwo, Champions and the Independent. He’s even written a couple of children’s football books which can be bought for about 13p on Amazon. Favourite players include Kevin Horlock and John Moncur. Best moments as a Town fan involve Wembley, Birmingham City, Reading, Charlton and Leeds. Can sometimes be heard talking utter drivel next to Chris and Vic for the Beeb. Loves meeting – and talking nonsense – with Robins fans. Daniel Hunt – Second Cousin of Town legend Roger ‘Ernie’ Hunt – has Swindon in his blood. Toothill born and Stratton raised, he owes his life of misery to his Dad who took him along to watch the Robins beat Wolves 3-2 in October 1994. Blessed with the patience of Michael Atherton and the diet of Neil Ruddock, Daniel is a willing cricketing all-rounder and a ropey Sunday League centre half. Daniel was mascot for his 10th birthday when a Grazioli inspired Stevenage Borough dumped Swindon out of the FA Cup 3rd Round in 1998. Four relegations, two promotions, two failed play-off campaigns and two periods of administration later, Daniel is now channelling his energy into writing about his first true love! He’s worked alongside Shaun Hodgetts and Ed Hadwin on work experience for BBC Radio Wiltshire as well as regularly writing the Swindon Fan’s View section for The Football League Paper.